"All glories to Radharani! She is so dear to Krishna. Everyone is trying to love Krishna, but Krishna is trying to love Radha. Just imagine how great She is. Krishna prema is so valuable, but Krishna is after Radharani. She is so great. We have to offer Her our respects. "Of all the young girls, Radha is the most beautiful. She always dresses so nicely that Damodara is attracted by Her beauty. 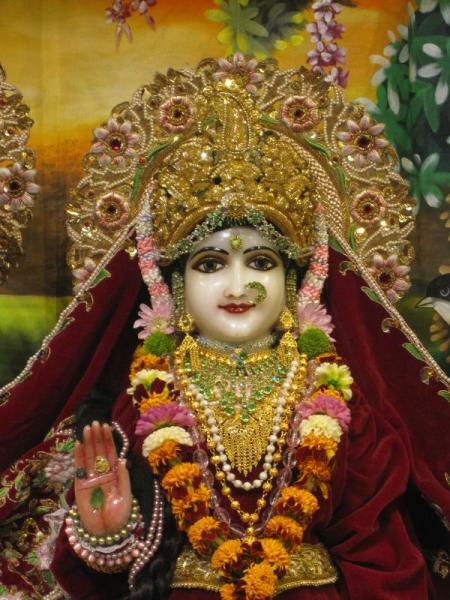 If you go to Vrindavan you will find everyone worshiping Radharani. All the devotees in Vrindavan worship Radharani. The pure devotees pray to Radharani, 'O my worshipable Radharani! You are so full of mercy. I am begging for Your mercy.'"